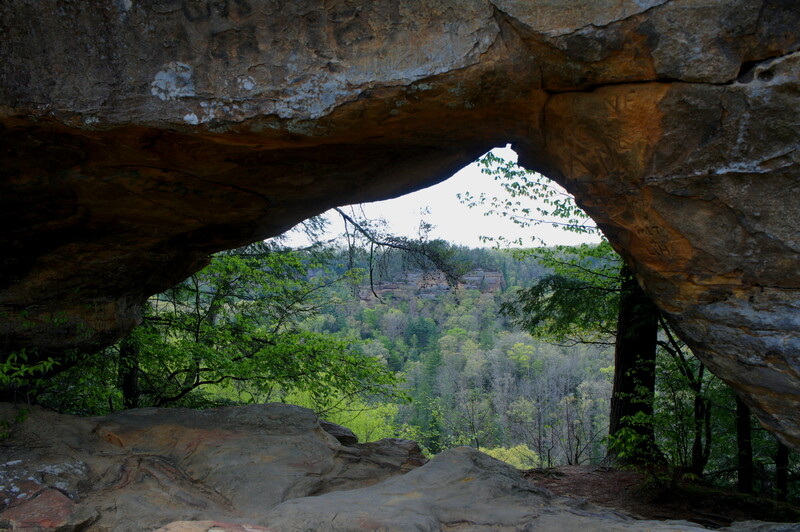 Kentucky’s Red River Gorge Geological Area in Daniel Boone National Forest boasts more than 150 natural arches—the largest collection east of the Mississippi. Among the easiest to access is Sky Bridge, a peculiarly-shaped aperture resembling something of a mix between a blocky anvil and a brontosaurus. 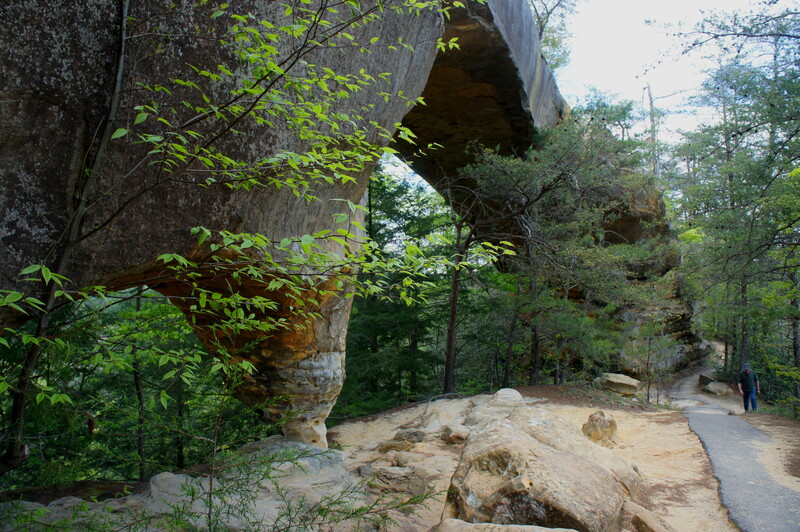 It’s a short (1/4 mile) walk to the top of the bridge, but it’s worth completing the 9/10-mile circuit for multiple views of the arch, as well as the colorful gorge to the north and east. 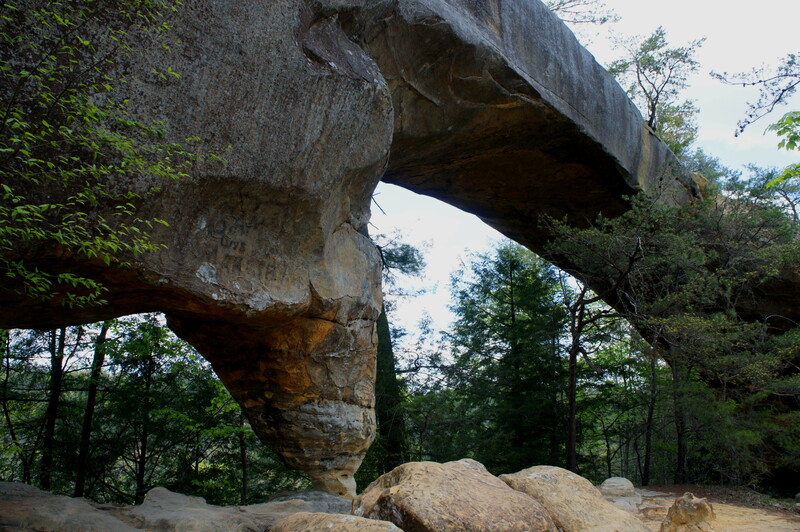 Reaching the Sky Bridge Trailhead (Trail #214) is easy by Red River Gorge standards, where some of the best hikes lie at the end of long and winding unpaved roads. The 8/10-mile Sky Bridge Road—a one-way drive beginning five miles north of Pine Ridge, Kentucky—is paved for its entirety. The trail begins at the end of the road, where the drive forms a small loop; you may park 50-100 yards before the start of the loop section on the left or right. Continue straight at the trail sign, ignoring the steep track entering from the right. The first 2/10 mile of the route—asphalted and (at least theoretically) wheelchair-accessible—cuts through the forest and quickly emerges from out of the trees at a curious feature: what appears to be a flat, gray sandstone bench. A sideways look to the left or right reveals that this is no bench—this is in fact the top of Sky Bridge, and one must traverse its length to complete the loop. Be careful, of course—while the way across the bridge is plenty wide, there is no guardrail to prevent an unfortunate fall over the brim. 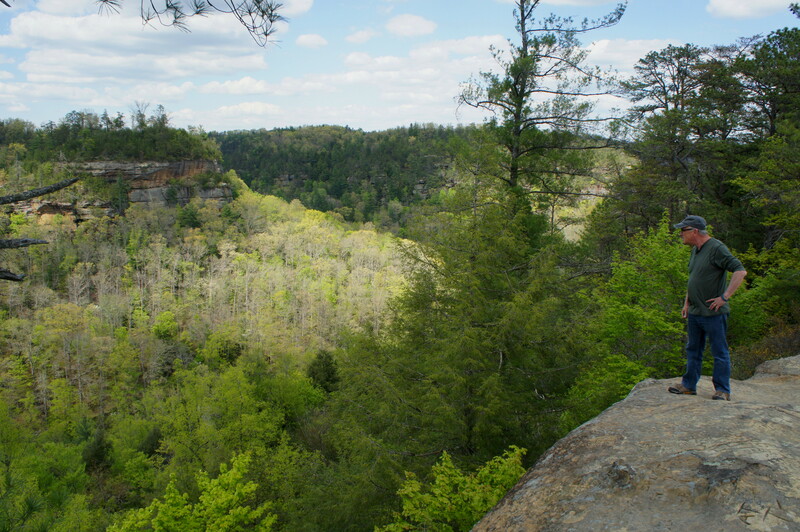 Also take a minute to peer across the Red River Gorge to the Clifty Wilderness to the north. The yellow-brown rock visible along the rim is called Corbin sandstone, deposited roughly 300 million years ago. There are occasional metal handrails as you approach the tip of the rocky promontory jutting out to the east. As the trail makes a hard right at the end of the finger-like ridge, it drops down a series of stairs and begins to cut back to the west, this time roughly some 50-70 feet below the starting point. 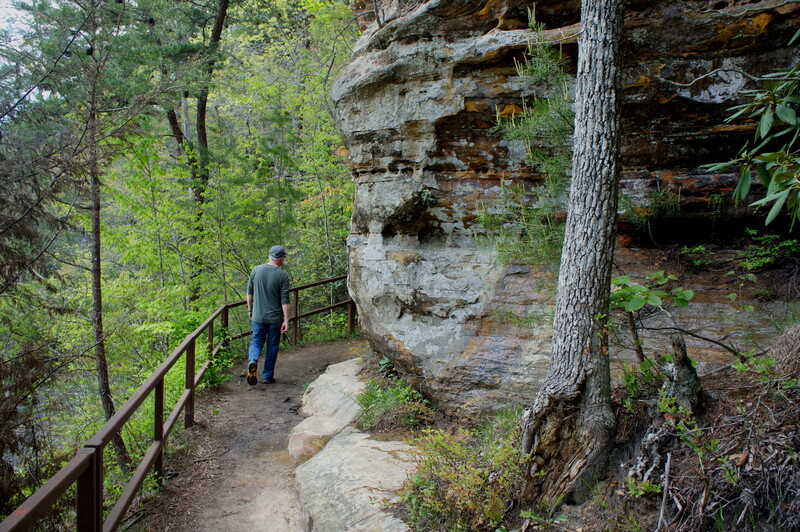 The trail then hugs the neatly-striated cliffside for several hundred yards, eventually climbing again up a short flight of wooden stairs. 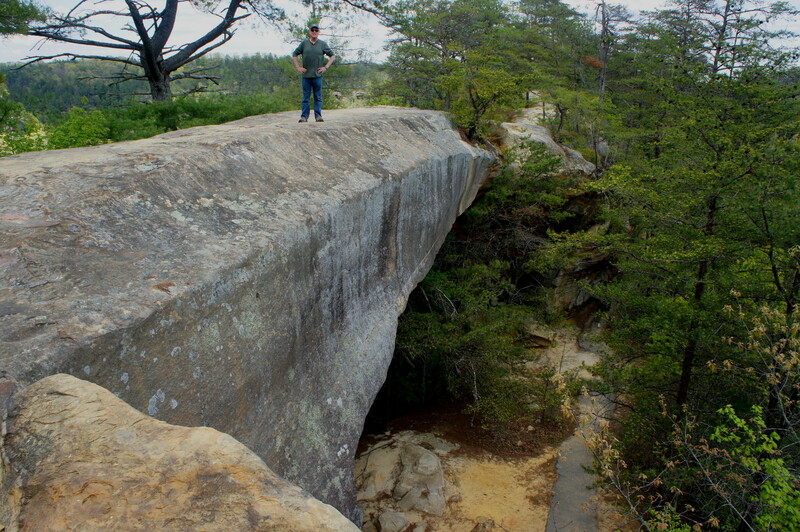 Soon enough, you’re at the base of Sky Bridge, a smooth overpass formed by thousands of years of erosion. Interestingly, the bridge actually features two windows—one large and one small, separated by a supporting pillar gnawed so thin that one begins to worry about the stability of the entire arch. The trail beyond is arguably just as interesting. 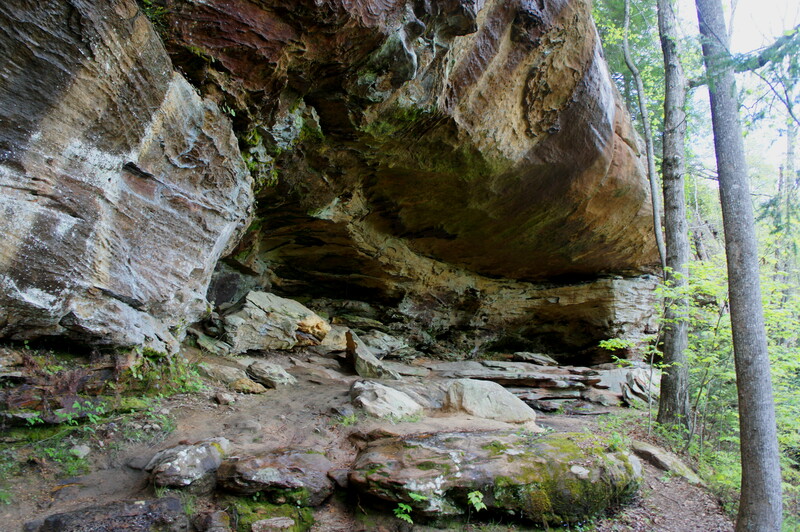 Still hugging the cliffs, the trail enters a densely-vegetated hollow dotted with ferns, culminating at a tranquil cave-like “rock shelter,” or alcove. 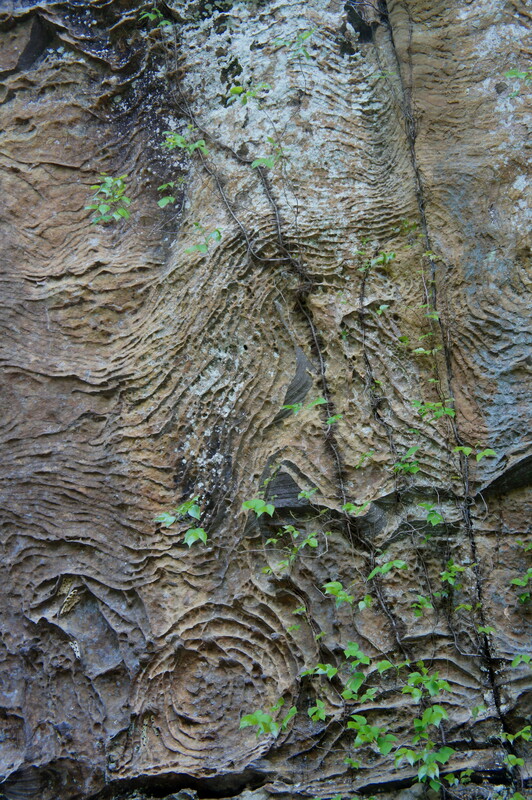 Check out the wavy and circular designs in the Slade formation (a mix of siltstones, limestones, and shales) along the far wall. Just beyond the rock shelter, the trail gains elevation quickly—climbing three flights of neatly-constructed stairs to clear the high wall. From here, the trail zig-zags back to the trailhead and the parking area. Allot a half to full hour for the 0.9-mile round-trip. While the first 0.2 miles are handicapped-accessible, the rest—due to stairs and withering asphalt—is not. 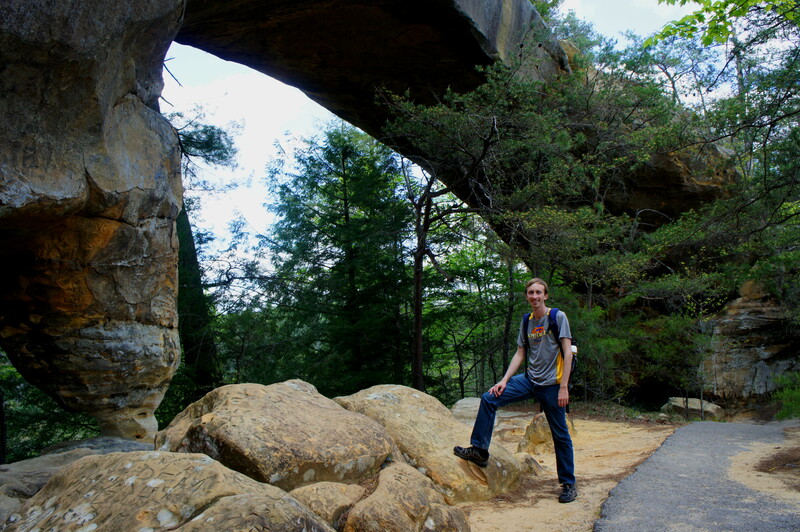 This entry was posted in Daniel Boone National Forest, Kentucky, Moderate Hikes and tagged alcove, arch, Corbin sandstone, Daniel Boone National Forest, Kentucky, loop hike, Red River Gorge, Sky Bridge, Sky Bridge Loop, Sky Bridge Trail, Slade formation. Bookmark the permalink.